Seems like it is painted on, hence the family name Rembrandt tulips. 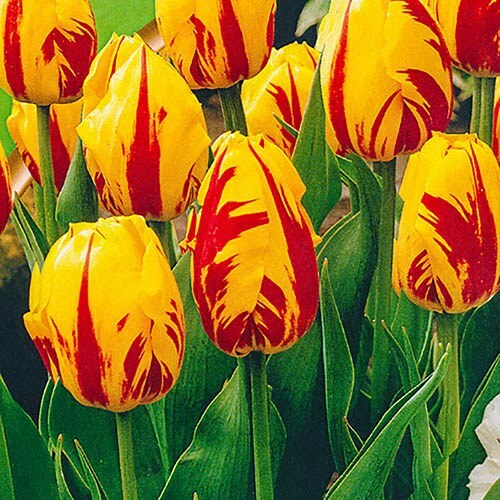 These eye-catching yellow petals are feathered with a rich red streak that seems like it is painted on - hence the family name 'Rembrandt' tulips. They're suprisingly tough and weather resistant and are a cross between early and late flowering varieties which gives them the added benefit of an extended flowering period. You'll get strong and long-lasting displays in the garden but you'll also be able to create the most beautiful indoor displays by cutting, bringing indoors and displaying in vases on windowsills and mantelpieces. Tulips are one of the most popular bulbs as they are perfect for planting with many different colour variations, giving your garden, patio or decking a vibrant spring makeover. They also make great cut flowers to brighten up the house! Supplied as a pack of 15 bulbs, ready for planting. Size 11/12.